No, you’re not dreaming. Chewbacca did actually speak English or, more accurately, the man behind the furry mask, Peter Mayhew delivered Chewbacca’s lines. In a cool behind-the-scenes look at filming of the Star Wars original trilogy (taken from the Chewbacca actor’s Twitter account), Mayhew barks lines down at Han Solo below. “Where the hell have you been?” screams Chewie, hilariously, in a thick Yorkshire accent before becoming even more irritated and shouting breathlessly, “Where are you going?” It’s the Wookie-to-English translation we never knew we needed. Does it spoil the magic of the movies? Hell, if anything, it makes it better. Imagine a large, angry Yorkshireman shouting at Han for boasting about the Millennium Falcon making the Kessel Run in less than twelve parsecs. It would be more fun than Jar Jar Binks, that’s for sure. 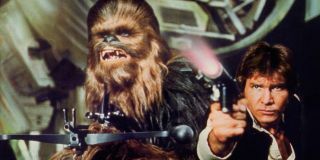 In Star Wars lore a Wookiee’s garbled growls and yelps are a language called Shyriwook but we actually sort of prefer Peter Mayhew’s accent - it’s achieved the impossible and has made Chewie sound even more pissed off at Han Solo – and that’s no mean feat.